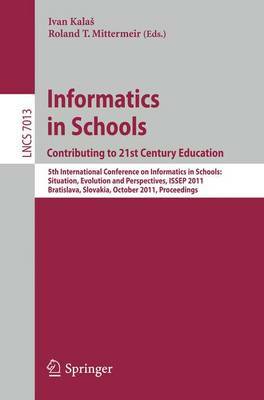 This book constitutes the refereed proceedings of the 5th International Conference on Informatics in Schools: Situation, Evolution and Perspectives, ISSEP 2011, held in Bratislava, Slovakia, in October 2011. The 20 revised full papers presented were carefully reviewed and selected from 69 submissions. A broad variety of topics related to teaching informatics in schools is addressed ranging from national experience reports to paedagogical and methodological issues. The papers are organized in topical sections on informatics education - the spectrum of options, national perspectives, outreach programmes, teacher education, informatics in primary schools, advanced concepts of informatics in schools, as well as competitions and exams.